Michigan consists of two strips of land—peninsulas—almost entirely surrounded by water. The Lower Peninsula is bordered by Lake Michigan, Lake Huron, and Lake Erie. The Upper Peninsula is bordered by Lake Superior, Lake Michigan, and Lake Huron. All this water makes for snowy, cold winters, but beautiful natural settings that draw summer vacationers. 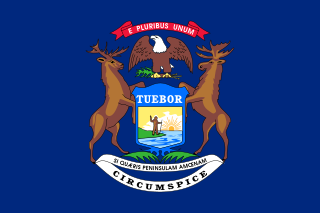 People have lived in the land that is now Michigan for at least 12,000 years. Eleven American Indian nations still live here today. French fur traders first settled in the area that is now Michigan and enjoyed friendly relations with native peoples. The Indians weren’t so friendly to English settlers who came later. Fierce battles became common. Most people live and work in the Lower Peninsula, but enjoy traveling to the Upper Peninsula for vacations. This area has gorgeous national forests, wildlife, lakes, and streams. In 1957, Mackinac Bridge was built to link the two peninsulas. The bridge is five miles long. In the late 1800s, people many people made their wealth through the railways. In the 20th century, Michigan became home to Chevrolet, Ford, and GM automakers. The state’s economy has been largely dependent on these companies. In recent years, Michigan has been trying to attract other industries. 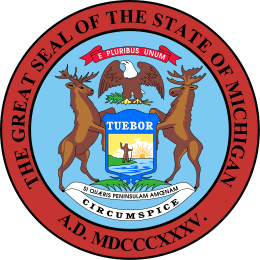 Singers Madonna, Stevie Wonder, and Diana Ross were born in Michigan. The Kellogg brothers invented Corn Flakes in Michigan. Question: What animals live in Michigan? Answer: Michigan is more than 50 percent forest and has the most fresh water coastline of any state. With all this nature, it is home to many animals, including moose, elk, white-tailed deer, skinks, turtles, and snakes. It’s also a great place for fishing. Watch a video about Michigan. Declan, Tobin. " Amazing Michigan Facts for Kids ." Easy Science for Kids, Apr 2019. Web. 25 Apr 2019. < https://easyscienceforkids.com/michigan/ >.